American DJ Vizi Beam 5R Moving Head Fixture DJParts - All Variety of Parts that DJ Needs. 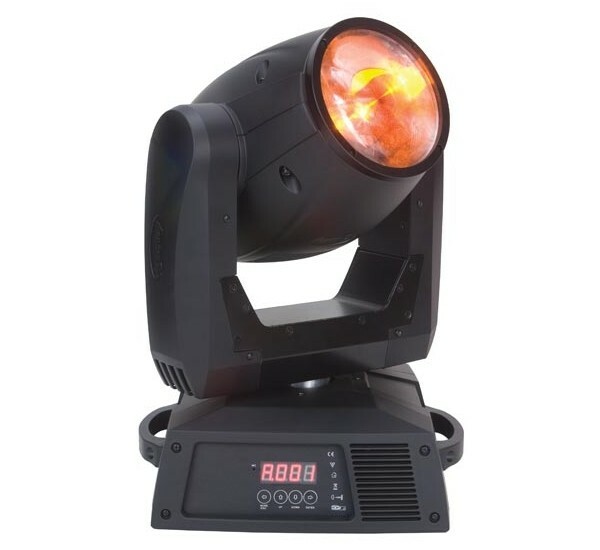 • RDMX - Remote DMX addressing (Change DMX values remotely from any DMX Console) • 4 operational modes: DMX, Master/Slave, Stand Alone & Sound Active • 12 DMX channels • Gobo scroll mode • LED DMX 4-Button menu system • 3-degree beam angle • Auto X-Y repositioning • 12 dichroic colors + white (UV included) • 14 static, fixed gobos + spot • 3D Prism with macros • Gobo Shake effect • Gobo size: 6 mm viewable gobo size • Independent gobo and color wheels • Pan: 360-degree standard (540-degree optional) • Tilt: 270-degree • Auto Focus • Shutter: Pulse effect; random strobe slow to fast • Dimming: 0% - 100% • Strobe effect • Frost Filter • Stepper motors with micro stepping • Hanging bracket included • 3-pin & 5-pinXLR In/Out • LUX: 99250 @ 10M, 70030 @ 15M • Lumens: 8000 LUX • Multi-voltage Operation: 115V/60Hz or 230V/50Hz (Switchable) • Lamp: Philips® Platinum 5R discharge, 8,000°K - 2,000 hr. long life • Dimensions (LxWxH): 13.25”x12.25”x17.75” / 335x310x448mm • Weight: 25 lbs. / 11 kg.